The growing season here can be pretty short, we aren't really frost free until the second week in June, although it can be much earlier than that, anything before is a risk. So to extend the season I start most tender plants off in the greenhouse or in the house. Pepper plants and other seedlings coming along, melons and cucumbers mainly as well as more strawberries. This year I've been using the windowsill to their full potential, starting lots of seeds in my heated propagator as well as potting on tomatoes and letting them grow on in the house. 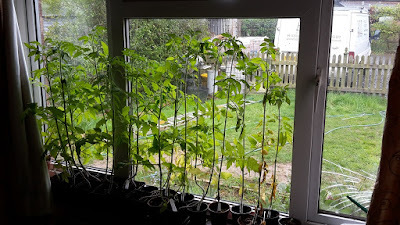 I've still got lots growing in the greenhouse but this way I'm hedging my bets encase it freezes hard one night and I don't realise in time. So all my south facing windows are full, there's about nine varieties of chilli peppers, three types of tomatoes (with another 6 types in the greenhouse) and then some Minnesota melon seedlings, heritage cucumber and a Mexican herb I've forgotten the name of spread all round the house. 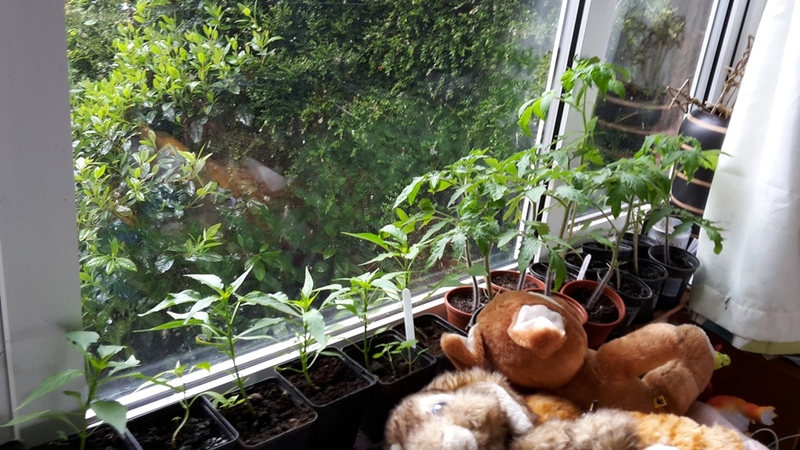 The only room I've haven't put plants in is my girls bedroom as it has a blackout blind and I'd rather go without tomatoes than that in the summer, as it makes them sleep past sunrise! Some leggy Tomatoes, they should be okay but it shows that starting them too early can be a bad thing. Some are just forming their first truss. Who else has a house that's filling up with plants desperate to go outside? 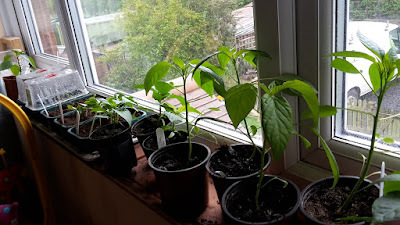 I have a large black tray, which I purchased for using compost and potting, but at this time of year it's on my spare bed, full with little pots of seedlings, the spot is sunny and warm. I can keep loads of pots in it and it's great at this time where I can carry them all out in one go as the hardening process gets on the way. Hardening off can be a nightmare for me as I end up moving hundreds of pots each morning and night. Every year I say I'm going to make some cold frames to make the job easier and every year I don;t get round to it! kev - in my tiny kitchen i have a stand with 4 shelves that has a plastic cover and jambaloney built a thingy-ma-jig so that there are 2 fluorescent long lights on each side of it. the stand sits in front of our kitchen door which is full length window. and i start all of my delicate plants in it. my tomatoes have to go out tomorrow into 5 gallon pots in the greenhouse. that will start the hardening off process for them. our 2 week long range forecast has no frost so they should be ok. and then that will clear up some shelves to start other things. i've already started lettuces and amaranth in the greenhouse - both are doing fine. as well as sunchokes and some herbs. can't wait to get things in the ground tho....i am sure you are feeling the same way! Over here we vouch by the 'Ice Saints' whose days fall on May 11th, 12th, and 13th. After then we are promised no more frosts. I, of course, being foolhardy plant out all my tender plants well before. I've been lucky for the last 3 years... maybe it's the global warming. I have put my tomatoes outside today. will have to think about bringing them in. 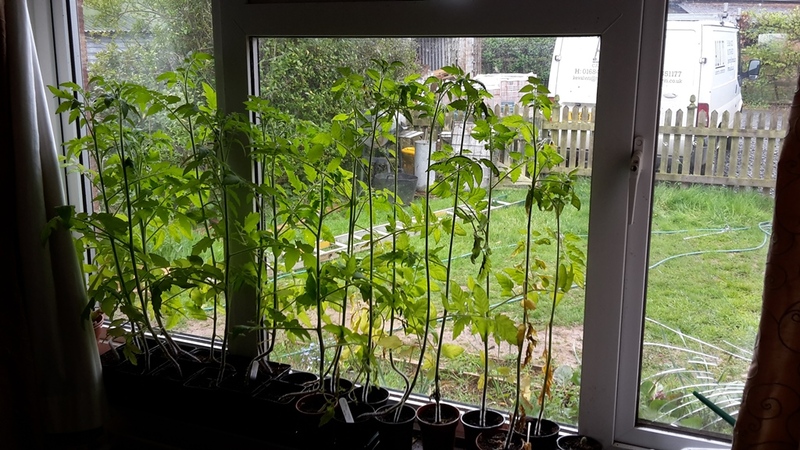 All mine are out in the poly tunnel, two of the tomatoes are now in flower, I moved everything out last month and covered them with fleece at night, everything has done OK, its as close as I get to hardening off.